1Department of Food Technology, Pir Mehr Ali Shah Arid Agriculture University Rawalpindi, Pakistan; 2Food Science and Product Development Institute, National Agriculture Research Center, Islamabad, Pakistan; 3Oil Quality Lab, Oilseeds lnstitute, National Agriculture Research Center, Islamabad, Pakistan; 4Social Sciences Research lnstitute, National Agriculture Research Center, Islamabad, Pakistan. 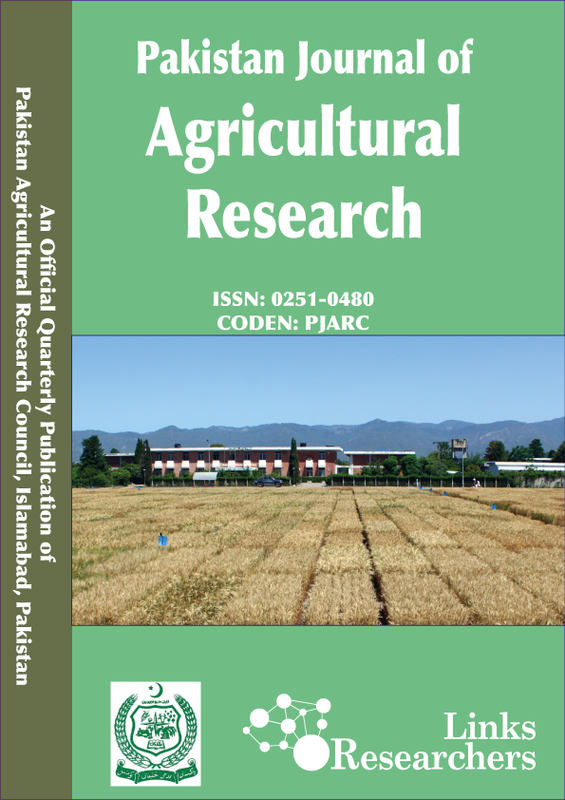 Three indigenous peanut cultivars from Pakistan specifically Local-334, Bard-92 and Bard-479 were investigated in the study for compositional quality and peanut butter development. Chemical composition of peanut cultivars indicated 5.53±0.20 to 5.93±0.02 % moisture, 2.00±0.11 to 2.17±0.05% ash, 49.80±3.54 to 50.90±0.93% fats, 23.83±1.71 to 26.43±1.15 % proteins, 13.23±2.20 to 19.42±3.83 % carbohydrates and 4.95±0.06 to 8.53± % fiber. Mineral analysis of peanut cultivars showed 12.60±0.38 to 16.61±1.51 mg/100g Fe , 2.34±0.075 to 3.37±0.040 mg/100g Zn, 38.64±3.50 to 48.24±32.58 mg/100g Ca, 67.81±7.86 to 82.72±9.09 mg/100g Mg, 199.19±33.18 to 342.00±19.03 mg/100g Na and 1220.6±9.045 to 1411.3±1.71 mg/100g P and 841.01±50.41 to 992.98±36.10 mg/100g K. Fatty acid characterization of groundnut cultivars through gas liquid chromatography revealed six fatty acids namely palmitic acid, oleic acid, linoleic acid, arachidic acid, eicosenoic acid and behenic acid. The peanut cultivars Bard-479 and Local-334 were more suitable for oil extraction and peanut butter development because of their high oleic acid to linoleic acid ratio (2.3-2.4). Bard-92 was less preferable cultivar for product development owing to its high linoleic acid (42.56%) and low O/L ratio (0.93) that attributed to its oxidative instability. Sensory evaluation of peanut butter samples showed overall good acceptability of product among the people. Storage study of peanut butter samples demonstrated shelf stability of product up to three months at room temperature.